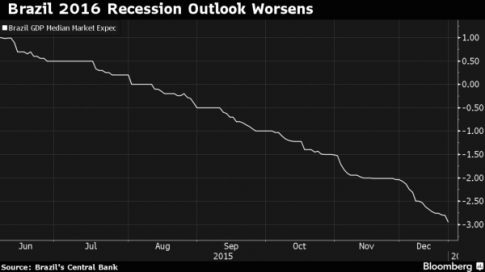 As we kick off the new year, there is perhaps no more tragic economic story than that of Brazil. Once an EM darling, Latin America’s largest economy fell off the deep end in 2015 as a perfect storm of falling commodity prices, depressed demand from China, a soaring dollar, a devalued yuan, and an intractable political crisis plunged the country into what even the sellside has begun to acknowledge is an outright depression. Inflation is running in the double digits and the country is facing an unemployment crisis which is bad news for an economy in which consumers have levered up in recent years to finance a middle class lifestyle. Meanwhile, President Dilma Rousseff is battling for her political life as House Speaker Eduardo Cunha presses ahead with an impeachment bid even as he faces his own set of problems tied to the Car Wash investigation. Finance Minister Joaquim Levy was shown the door after political gridlock left him unable to implement much needed austerity measures. The market is concerned that his replacement, Nelson Barbosa, is less inclined to fiscal responsibility despite his best efforts to convince investors and ratings agencies otherwise. In short, everything that could go wrong in 2015 did go wrong – and then some.